Ukraine will start the withdrawal of heavy weaponry from separatist rebel lines in the east, the military says. The two sides agreed on September 20 to set up a buffer zone in eastern Ukraine, more than a fortnight after a shaky ceasefire came into force. 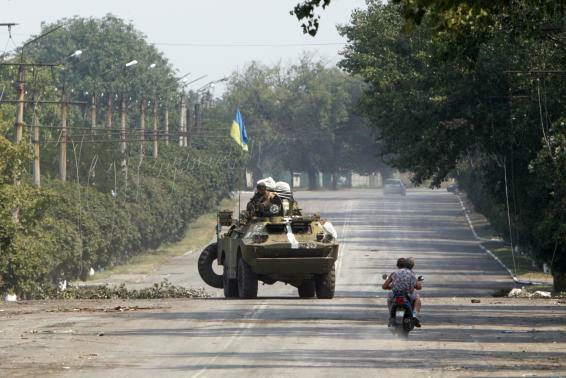 Although the truce is still in place, clashes have continued around the cities of Donetsk and Mariupol. More than 3,000 people have died since fighting broke out in the two regions of Donetsk and Luhansk in April. Ukraine’s parliament passed a bill last week granting three-year “self-rule” to parts of the Donetsk and Luhansk regions – a decision condemned by some lawmakers as “capitulation”. Under the terms of the nine-point deal agreed in Belarus, both the pro-Russian rebels and Ukrainian forces are to pull back their heavy artillery 9.5 miles from the line of engagement, creating a 20 miles buffer zone. Ukrainian National Security and Defense Council spokesman Col Andriy Lysenko said pro-Russian rebels had for their part begun moving their heavy artillery, but it was “not as massive as we expected”. Artillery and armored vehicles with a caliber greater than 100mm would be moved, but all other units and their weapons would remain in place, he said. According to the deal, military aircraft are banned from flying over the conflict zone and “foreign mercenaries” are to be withdrawn on both sides. Foreigners are known to be fighting on both sides and Russia has repeatedly insisted that any of its citizens fighting alongside separatists in Ukraine are doing so in a private capacity. Checkpoints manned by Ukrainian forces had come under heavy shelling at Donetsk airport and near Mariupol, Ukrainian media reported on Monday. Col. Andriy Lysenko said that two servicemen had been killed in the past day.